ACCO: More than a strategy, a changing paradigm. Are Christmas cards still important? Argentina: October was the "Month of Comic"
edding promotes murals in Colombia. For the third consecutive year, Antalis was named "Supplier of the year"
Newell Brands: "Our writing business is stronger than ever"
Peru: Faber Castell is recognized as an "Ally for Education"
Peru: New edition of "La noche del arte"
Peru: Wong, Metro and Kimberly Clark join in "Reciclame, fulfill your role"
Staples shareholders approved Staples sale and the acquisition was concluded. USA: Back to school has become "unpredictable"
Venezuela: school supplies manufacturers’ stock at a critical point. What is lettering or creative calligraphy? 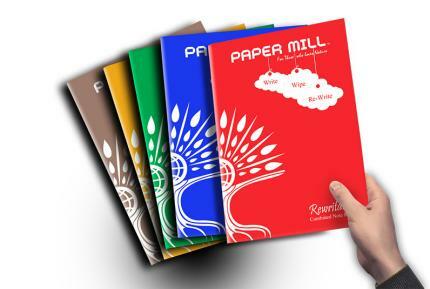 The producer Edutainment Publishers - based in Hyderabad, India - offers Paper Mill, a notebook that can be deleted and rewritten. This alternative, being reusable, contributes to the use of less trees in the production of notebooks. As if this were not enough argument, the brand produces all its notebooks with recycled paper, based on an innovative initiative of the Indian Institute of Technology (IIT) Kharagpur. The offer includes simple notebooks, writing notebooks, combined notebooks and drawing books. To write in these notebooks you should use a pen of gel or sketch but not conventional pens. When using this type of inks it can be erased only by rubbing with a damp cloth. The pages are thick, resistant and can also be written and rewritten on the covers. In addition, and it is an interesting advantage, all the notebooks are completely waterproof. The response in terms of sales has been really good, although the notebooks were available to the public just a few months ago. "We sell these notebooks at events that promote initiatives friendly to the environment. But most importantly, the notebooks are available at Amazon and Flipkart, "said Sumanth B, managing partner of the publisher. Completing its offer of rewritable products, the company will put on sale in the first half of this year its first digital book of notes, will have 40 pages and will be connected to Google Drive.